Letter discovered in the 1930 Yokohama Taiko-Gata lantern, Seward Park. Dragon envelope is still sealed shut with wax. “Don’t give up! My friend is beginning to show signs of saving the treasure. 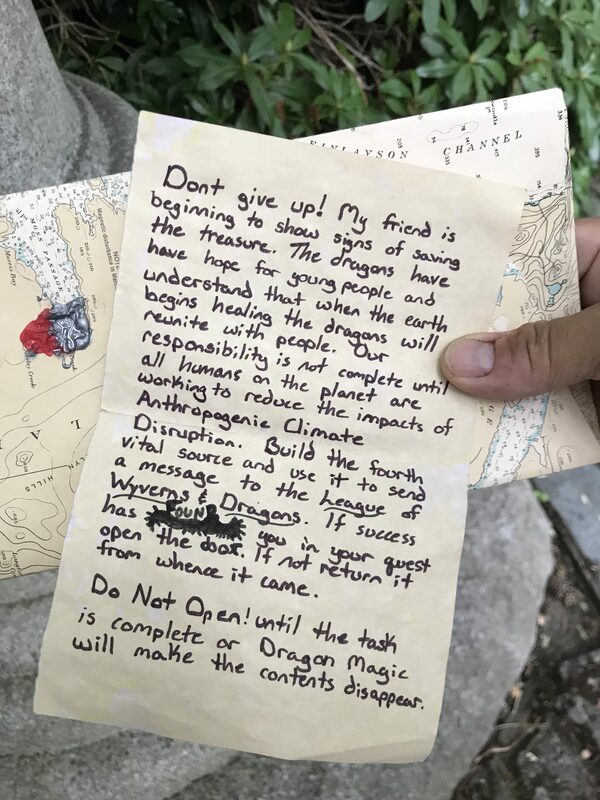 The dragons have hope for young people and understand that when the earth begins healing the dragons will reunite with people. Our responsibility is not complete until all humans on the planet are working to reduce the impacts of Anthropogenic Climate Disruption. Build the fourth vital source and use it to send a message to the League of Wyverns & Dragons. If success has found you in your quest open the door. If not reutn it from whence it came.